Police Cat Fuzz Rides Again! 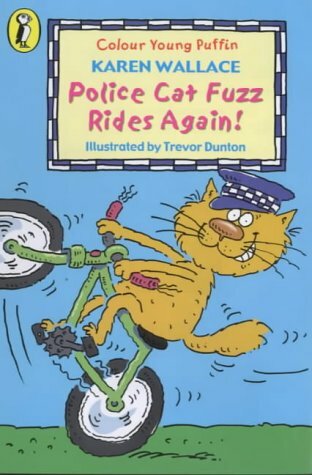 A follow up to Police Cat Fuzz, this is a fast moving, light-hearted and amusing story, targeted at developing readers. Police Cat Fuzz and Sergeant Malcolm are partners, though many in the force believed wrongly that the partnership would not last. Fuzz is a smart cat who, together with Sgt Malcolm, seeks to track down the town's villainous diamond thieves Rat and Wrestler - criminals who are clueless when it comes to perfecting the art of disguise. With the help of a fake set of the famous Stars of Hendon diamonds and a formidable opera diva in Gwendoline Surge, the baddies get their just desserts. The colourful half page illustrations on each page are well suited to a tale which doesn't take itself too seriously and so consequently is very successful in entertaining young readers.